In these times of high price rise and inflation India is experiencing, conducting expensive rituals like Vastu Shanti is not for every one. This site has in the past published numerous cost effective measures to keep your home vibrating with positive vibrations. This simple Yantra which is given here has to be prepared on a thick copper square and kept in the Pooja Place or fixed to the main door of the house. This simple Vastu Shanti Yantra acts like a protective charm and is said to keep harmful and negative vibes out of your home and usher in all that is positive. 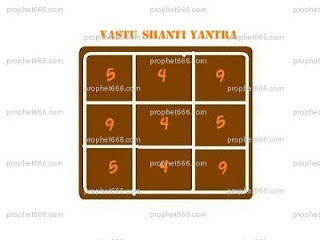 The Yantra vibrates to the numerological vale of the numbers 4, 5 and 9; totaling 18 from all side; which adds up to 9. All vertical lines are not adding the total of 18 please again and confirm me so that i can go ahead in making this yantra. And can we make this yantra on blank paper if we do not get thick copper? Is it advisable to make this Yantra on Paper with any kind of ink?